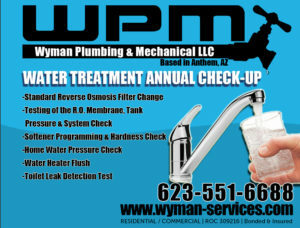 Wyman Plumbing of Anthem, AZ, encourages you to experience the clear difference that luxurious, treated water brings to your family. 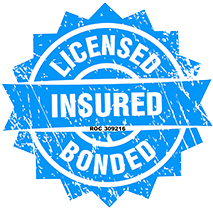 We can provide you with the installation, maintenance, and repair of your water quality systems whether it be a Reverse Osmosis, Water Filtration or Water Softener system. Our water treatment solutions will bring an entire variety of benefits that include a cleaner, better tasting water from every tap, faucet, and shower, less scale for easier cleaning and longer appliance life, and greater contaminant removal for peace of mind. Think effective and efficient. 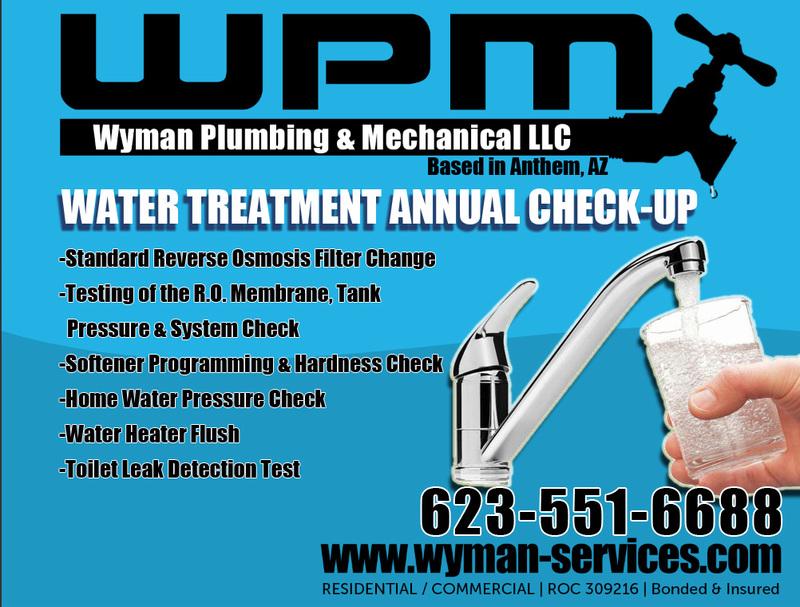 Our water quality professionals can show you the options for the right kind of system for your needs and assist you with a free, no-obligation in-home estimate. Water Softeners: Why soft water? Simple. Nobody likes those yellow stains, scale deposits and buildups you get on your sinks and bathtubs from the minerals in hard water. Nor is the odd smell and taste of hard water something you crave after a hot Arizona summer day. Do you need more reason to switch to soft water? How about knowing that those scale deposits eventually clog your plumbing and shorten the life of appliances all over the house such as dishwashers, coffeemakers, humidifiers, water heaters and washing machines. The solution to the removing the hassles caused by hard water is simple – our water softener system! Reverse Osmosis Drinking Water Systems: The secret is the “R.O.” of the system. Although it sounds technical, osmosis is a process that occurs in nature on a continuous basis. It is a natural, organic phenomenon. Our R.O. Drinking Water System will provide you with delicious, sparkling-clear drinking water. Think – fresh, clean water at your faucet for convenience, flavorful juice, quality water for your aquarium, cleanly rinsed fresh fruits and vegetables, better tasting soups and sauces, and spotless glassware! It is environmentally sound with no chemicals! 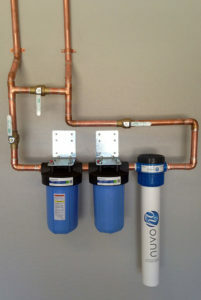 How does our Reverse Osmosis systems work? The pressure from a household tap forces water through a semi-permeable membrane which separates the water at the molecular level. The membrane acts like a filter, assuring the Reverse Osmosis water has substantially reduced impurities and dissolved solids. It is ready at your convenience as a cleaner, more refined water stored in the holding tank. 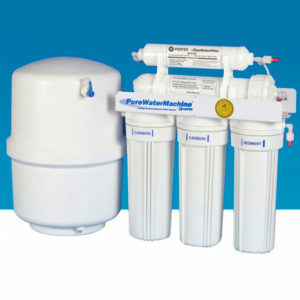 Water Filtration Systems: Without a water filtration system, the plant-treated water still contains the remaining chloramines and chlorine even though it is treated and cleaned at the plant. After all, it is a long journey from a water treatment facility to your household pipes. As water travels to your home it can pick up numerous contaminants such as microorganisms, sediment, and silt. The individual water tap filters or whole house water filtration systems are designed to remove any remaining contaminants or even other water impurities caused by pipe corrosion. According to the US EPA, “Every home in America has an elevated level of chloroform gas present due to the vaporization of chlorine and other chemicals from tap and shower water.” The whole house filtration system will benefit every aspect of your family’s health. One of the most crucial items to any living creature is pure water. Without water, there can be no life.